Duality, an exhibition from Melbourne artist, Bailer, at fortyfivedownstairs, Melbourne. Featuring paintings and sculptural works that traverse liminal states of being, Duality aims to explore the ever-changing state of the human condition. Through abstraction, the viewer is immersed, unlocking their own mutable states of mind and coming to understand that nothing ever stays the same. All is fluid, moving. In Bailer’s own words: I have used art (and an array of other activities) as a form of escapism for many years. Graffiti, muralism, sketching, writing, all forms of creativity I have used to escape the hands of time, the act of contemplating my own successes/failures, impending mortality, the inequities of an unjust society. Getting deeply lost in the creative process is like ducking my head below the breakers. The roar of the ocean instantly forgotten in the calm below, surfacing for air briefly only to dive deeper. The noise of self- doubt, expectation and pressure fading into the depths. 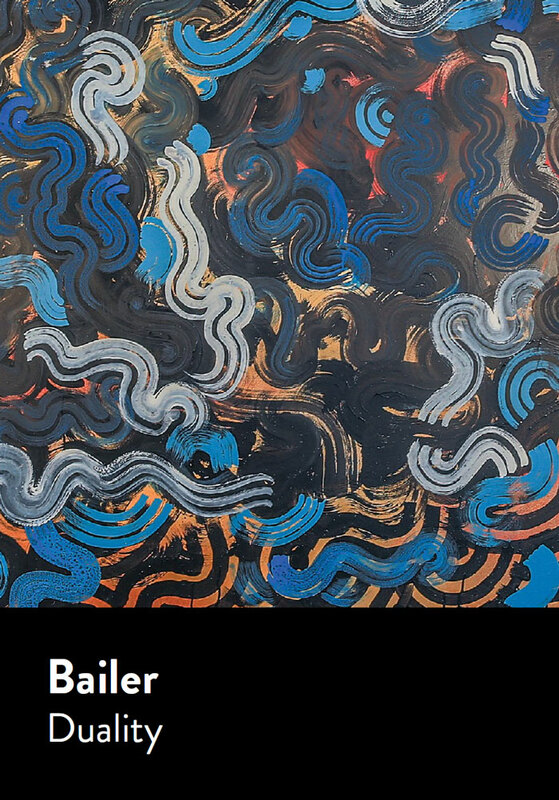 Painting publicly in Melbourne for 20 years, Bailer’s style is instantly recognisable. The roots of his work are embedded deeply in the graffiti subculture, and his new pieces push outside the self-imposed boundaries of genre. Bailer’s studio practice and public art incorporate a broad range of artistic modes.